556 pages | 163 B/W Illus. The first comprehensive review of sesame and its close relative, Sesame: the genus Sesamum covers ethnographic data, modern use, linguistic analysis of sesame names from around the world, market size, export and import data, geographical sources, use in the food and cosmetic industries, and much more. The book includes a historical review of the genus Sesamum that reveals its place in present-day traditions and cultivation in Africa and Asia. Expanding coverage from archaeological and anthropological literature from India, Mesopotamia, and Egypt, this ethnobotanical monograph draws on folk sources, reviews the phytochemistry of Sesamum, and presents extensive references. "This work will long stand as the standard reference on the subject, and one can only wish Professor Bedigian every success in seeing to completion her taxonomic revision of the genus." 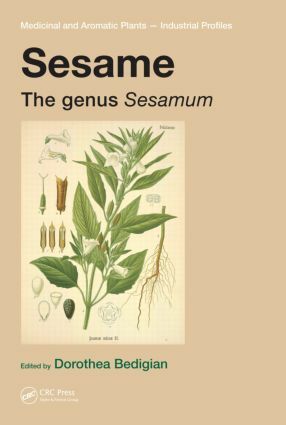 "It has been a life-long goal of Dr. Bedigian to assemble this extraordinary compilation (26 chapters, 36 contributors) defining all aspects of sesame, "a wonderful, but mysterious, plant that has had many uses throughout human agricultural history." This is not a compilation of prior information, but includes new data on traditional medicinal uses, historic documents, and the latest laboratory studies involving medicinal and aromatic constituents of sesame."